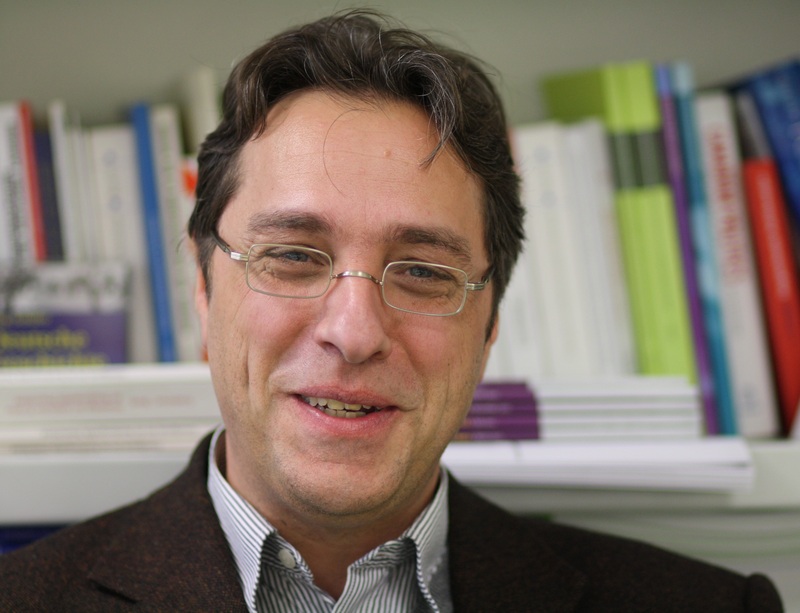 Klaus Detterbeck is Senior Researcher at the University of Göttingen, Germany. He conducts research on political parties, federalism and multi-level politics. His most recent publication is the co-edited Handbook on territorial politics (with Eve Hepburn, published by Edward Elgar, Cheltenham, 2018). The role of political parties in federal systems has been debated for centuries (for an overview, see Detterbeck, 2012: 14-29). For liberal thinkers, on the one hand, the federal system of checks and balances has provided an institutional guarantee for curing the “mischiefs of faction”, as James Madison famously put it in the Federalist Papers of 1787/88 (Hamilton et al., 1987). With the division of state competences, federalism creates regional bastions of power and thus structurally inhibits the emergence of unified and hierarchical parties (Truman, 1967). Recent accounts of this school of thought stress the importance of integrated parties, i.e. parties that organise and compete across the entire territory of a political entity. While such parties remain decentralised organisations, they are capable of multi-level accommodation and cooperation. Political stability stems from clever federal arrangements that provide incentives for parties to accept political decentralisation as a means to enhance their own electoral self-interests (Filippov et al, 2004). For supporters of popular sovereignty, on the other hand, federalism has hampered the expression of the democratic will of the people. The federal division of powers deprives citizens of their chances to choose among competing policy offers and to control decisions of their political representatives (Duverger, 1951). In this view, integrated and unified parties, which combine parliamentary discipline and programmatic coherence, are a way to transcend federal barriers. As state-wide parties, they can craft public policies aiming at legal equality and political efficacy. While federalism has its demos-constraining potential, parties may be key for demos-enabling political action (Stepan, 2001). Empirical research on the territorial dimension of party politics has mushroomed over the last twenty-odd years (e.g., Thorlakson, 2007; Swenden and Maddens, 2009; Hepburn, 2010; Massetti and Toubeau, 2014). Most of these works refer to the analytical framework developed by William Riker (1964) in what was the first systematic attempt of arriving at a party-based theory of federalism. Riker saw federal dynamics – movements towards a more centralised or a more decentralised distribution of legislative and administrative competences between the territorial levels – determined by the structures of the party system. In places, where state-wide governments can command their party fellows in sub-state office, the federal level will extend its hold. By contrast, in situations where different parties govern at different levels (partisan disharmony), sub-state governments will use their powers to withstand any attempts of centralisation (see also Filippov et al., 2004: 22-26). the degree of symmetry between the state-wide and sub-state arenas of party competition. the degree of vertical integration within party organisations. The first dimension, symmetry in party competition, refers to the degree to which political constellations are congruent between territorial levels. In party systems with high levels of symmetry, electoral behaviour is quite similar in state-wide and sub-state elections as the same kind of cleavages are structuring the different arenas. The individual parties are present across levels and they tend to choose the same partners for government coalitions. The less these characteristics are given, the more asymmetrical party competition is. In party systems with low levels of symmetry, there is a more autonomous space for sub-state politics. Asymmetry in party competition is often associated with the success of non-state-wide parties. In many places, non-state-wide parties, which focus their agendas on regional empowerment, have been highly important for the revival of a territorial dimension of party politics (De Winter et al., 2006; Hepburn, 2010). The second dimension, integration of party organisations, looks at the political linkages between different party levels. Integrated parties show a strong degree of formal and informal cooperation across levels which allows to paint the picture of a unified organisation which works for common political goals. There is a common membership structure from the local to the state-wide level, linkages between party elites in terms of career movements and mutual representation in leadership bodies, structures of joint decision-making with regard to party programs and strategies as well as a sharing of material resources (finances, staff). Parties in which these characteristics are weak have a low degree of vertical integration (Dyck, 1996). Integrated parties can be steered either from above or from below (Deschouwer, 2006: 293-94). Sub-state branches may have an important voice at the centre and possess some autonomy rights, or they may lack both. In order to clarify territorial power balances inside political parties, several scholars have resorted to the federal categories of shared-rule and self-rule (see Swenden and Maddens, 2009; Thorlakson, 2009). The former relates to the dimension of vertical integration, whereas the latter studies the capacities of sub-state branches to determine their own personnel and policies. 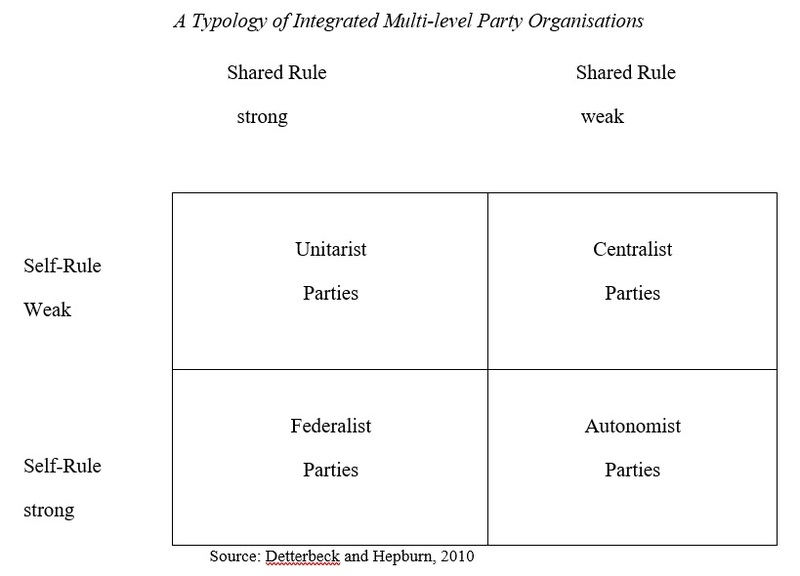 Capturing the possible combinations of self-rule and shared-rule, Detterbeck and Hepburn (2010) developed a typology of integrated multi-level parties. In unitarist parties, there is a high level of vertical integration combined with low levels of sub-state autonomy. Autonomist parties represent the opposite pattern. But there are also parties which score high on both scores; sub-state branches have leverage at central party level while controlling their own sub-state political turf (federalist parties). Finally, centralist parties are quite hierarchical. As the centre dominates all aspects of intra-party politics, both shared-rule and shared-rule are weak. 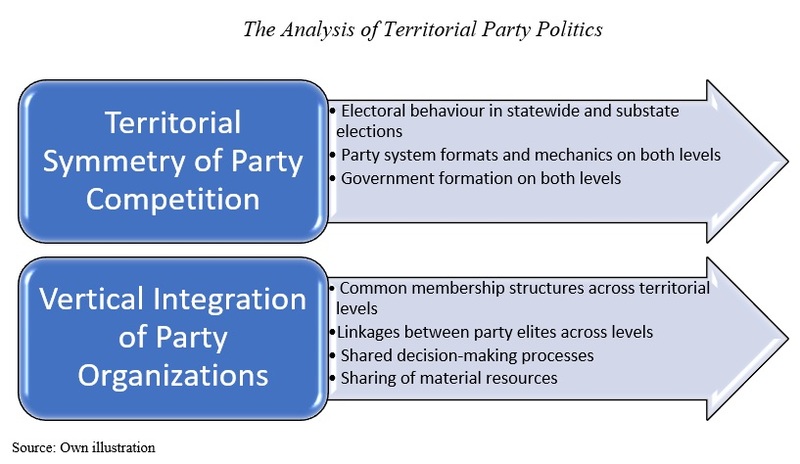 This typology of integrated parties does not include parties which are active at just one level (split parties) or have no vertical linkages between their state-wide and sub-state organisational levels (bifurcated parties). In a study on European multi-level party organisations (Detterbeck, 2012), I have argued that the mainstream Spanish parties, the conservative PP and the socialist PSOE, resemble the centralist party type. Both parties seek to maintain party unity by exercising top-down control over sub-state branches, while allowing them only limited influence over state-wide party matters. Interestingly, power balances have shifted to some extent in times of acute party crisis (e.g., loss of governmental power, leadership resignation). The German and Austrian mainstream parties have oscillated between the unitarist and the federalist party type. While the substate branches have always enjoyed privileged access to joint decision-making at central level, their making use of autonomy rights at the regional level has seen changes over time. In addition, there are some differences between party families. The Social Democrats in both countries have a stronger tradition of central interference in sub-state party affairs, while the Christian Democrats more easily supported the ideas of subsidiarity and regional autonomy. In Scotland and Wales, the British parties have come close to the autonomist model after devolution. Each party level regulates its own affairs with a considerable degree of discretion (except for the material dependence on the central party level). In Belgium, bifurcated parties compete on state-wide and sub-state levels but are restricted to one language community only. There are hardly any linkages to the ideological sister party in the other language group. With the federalisation of the country, the formerly unified parties split into Flemish and Francophone party organisations (for a more thorough discussion, see Detterbeck and Hepburn, 2010; Hepburn and Detterbeck, 2013; Detterbeck and Hepburn, 2018). Multi-level party organisations have found quite different balances between vertical integration and sub-state autonomy. These territorial balances are not fixed or immutable. There has been flexibility and movement in the ways parties have responded to their multi-layered environments, which have also been subject to change over time. One way at looking at this is to perceive of parties as reflective and adaptive organisations which mirror the environment in which they are competing for votes, public offices and policies. With respect to cleavages in society, it has been argued that parties are seeking to express a given level of territorial diversity. In more divided societies, parties tend to emphasise distinct territorial claims more strongly (Erk, 2006). Similar arguments have been made with respect to the institutional contexts of parties. Centralisation and decentralisation in federal systems, which occur due to factors exogenous to party competition (such as wars or economic depression), precede and trigger changes in party systems and party organisations. If authority migrates, the nationalisation or denationalisation of parties follows suit (Chhibber and Kollman, 2004). The more political competences are located at the centre, the more parties will revolve around state-wide policies (see Caramani, 2004). In more decentralised settings, the saliency of sub-state policies will grow. The general trend towards decentralisation and the territorial rescaling of the nation-state has enhanced the importance of sub-state electoral arenas (Keating, 2013). As a result, sub-state party branches have taken on a more autonomous political role, in particular if challenged by a non-state-wide party (Detterbeck and Hepburn, 2018). Yet, there is also another approach in the territorial parties’ literature. Here, there is a proactive role of parties shaping federal dynamics. Parties “adjust” the distribution of federal authority according to their own self-defined needs, whether they are related to organisational coherence, electoral success, the effectiveness of government, or policy objectives (Riker, 1964). Cairns (1977) has looked at the self-interests of sub-state political elites in Canada. He argues that federal decentralisation results from the political strategies of provincial governments in creating distinct territorial spaces with specific interests and preferences (“province-building”). Or, turning the argument around, Stepan (2001) has emphasised the capacities of state-wide parties to overcome federal hurdles in the pursuit of equal rights and uniform public policies by centralising federal politics. The strategic choices of rational politicians, shaped by their access to power resources and the logics of party competition, are seen as the proximate causes of federal change. Both approaches have their merits and their weaknesses. Empirical research has demonstrated how parties have adapted to federal structures while at the same time seeking to establish institutional solutions that better suit their needs. Watts (2004) has captured this very nicely in the phrase of a “two-way mutual interaction” between federalism and parties. There is an impact of federal institutions, but also of the electoral system and societal cleavages, on the territorial patterns of party competition and party organisations. At the same time, parties have an impact on (but do not determine alone) the operation and evolution of federal systems in their varying capacities for generating federal cohesion and providing intergovernmental linkages.